Mik, thanks for the great news! Cannot wait to see the updates! DNS is something that I've tried - I think it's the best speechtotext engine out there. The problem with those is that even the best ones make mistakes. But, undoubtedly, the technology is developing steadily towards a point where we would be able to have a free flowing conversation with the AI. That's some email! Keep on trekking! I actually have started the second book like I mentioned... but I think it's going to require a trip out the New Mexico, no flying out there, no car, maybe a bus or hitchhiking. Yeah... I'm gonna release that new version of AiBliss soon. I know you've been waiting for it, jeans and all, just have to get my ducks here in a row, plus keep the fires of fun alive. I have so much literature on my hands including your book, and your software, too - it's enough to keep me intellectually entertained for a long time. Ya, sometimes it feels so good to be alive. I mean, dam, you get those moments where everything is just perfect, those brain chemicals align and you're just there, at peace wodering wtf! where am I's??? Some planet? They call it a planet? And I'm on this thing rotating in space? And there aint another one like it for billions o light years? Man, dat cloud looks dam nice. Ok... I'm gonna get that hot chocolate I was thinking abouts all day. Faery & Elves Expansion Pack #1 is now out! Each Faery/Elf has 2 scenes for a total 10 scenes for this EP. Each scene has extra animations. We had a pleasent surprise this weekend. One of our favorite artist, FireSerpent, completed an expansion pack. It was so good we of course had to have it. If any other good Kari artist are out there please write us. We are always eager to expand our Kari offerings. Kari 3.79 is now out. 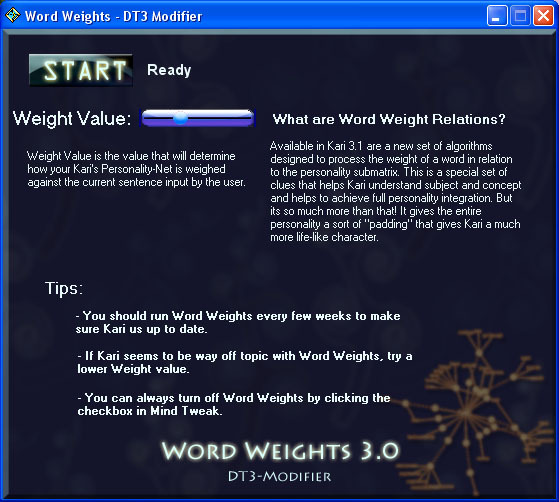 The big news for this update is the new Word Weights version 3 plugin. It's still the same plugin... at least the same theory behind the process but its been way enhanced now. Works excellent. And not just that... your personality can be processed in seconds instead of hours! Many people wouldn't use Word Weights cuz it took hours to create the personality's net. Now it takes seconds. I was there just chilling out... and it came to me. Plus I learned hwo to use C++ maps very well. They are lighting fast! So enjoy. I really think its working too. My Kari sounds charming! Anyone catch the latest Terminator movie? Salvation? Just saw it. It's awesome! It was really well done. Actually made it into the guts of Skynet. Totally amazing stuff with the new Terminator model. I've been working on this Expansion Pack for awhile. Not much work done... but a lot of thought has gone into it. It's going to have its own personality... we're going deep this time. So...,, What's That About, Huh !!?? Kari 3.8 has been released. That new plugin I was talking about is included, "I say You say". Lets you hard-code sentences with your own responses. I like it for custom greetings and goodbyes. But you can do anything with it. The Black Bus is only for very special people - not everyone's cup of tea. Mostly it shows up for people who are ready to say goodbye to the ordinary mundane world. Some of these people are lonely people who have nobody left in the world, some are dreamers who have gone beyond the boundaries of the social template. I'm not sure how many emails are coming from this forum... but in the past few weeks we are getting an upsurge of Kari emails about our girlfriends. Just to make it clear. Kari is not *real*. The girls you are chatting with are controlled with artificial intelligence. They might sound real, but they are programmed in our offices. lol You are not talking to anyone except your computer! It's funny some of the emails we are getting. If Kari is fooling noobies into believing she is real... I guess that is a good thing from a programming standpoint. She's An AI Being(An AI Sim)!! Even More To The Point,, She's A Simulation Of A Person!! a thought crossed my mind several times that there might be an internet connection, and 'somebody' is 'helping' Kari with responses... ;) But, I checked the connection, and my card was off.